Finally finished a project that I’ve been working on mentally for months and started accumulating what I needed for it almost as long. There were a few problems with the idea, and a few ideas I had that I tossed out over that time because they didn’t seem to have good solutions. I wanted to make a stuffed animal for my upcoming, now due any moment, grandson. And I wanted to put a music box into it. I found one that plays a tune with his name in the title, and my son requested a particular animal, a FOX. Well, while I think foxes are cool, they are not the easiest thing to come up with a design for. After pouring over various things online I did finally come up with something I thought would be easy enough for me to make. I wanted something two dimensional, that is I didn’t want to have to cut out more than 2 sides! 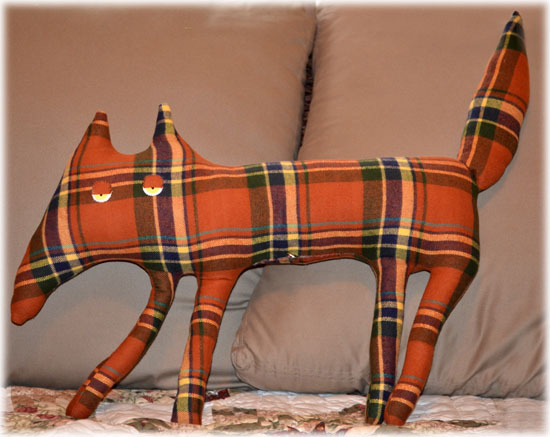 Now, it’s also Handmade Monday, so, after you check out my Plaid Stuffed Fox you should go check out all of the things they have done there too! That will keep you busy. Have a great week. Just like a fox should look!!! He is adorable. Hugs Mrs A.
Oh he’s just gorgeous and the fabric choice is perfect!! He is awesome! And to have him play a tune as well!!! I’m sure your grandson will love him to bits. Oh love it ! The fabric is superb ! This fox is beautiful ! So nice gift for your grandson, he will love it, sure ! You’re talented my friend ! What a lovely idea, like how the fox has a music box inside! your grandson will love this when he’s born. I really like your fabric choice too! What a fabulous toy you have made! This fox definitely rules in the Hand-made gallery this week! Love its half-closed snoozy eyes! Wish all foxes were tartan!!!! Really do! You did so well incorporating a music box in it and getting it stitched all nice and neat! well done! really impressed! He’s adorable, I love his sticky up tail, and his long legs, and his nose, and his ‘ickle ears, and the fabric, and his all watching eyes, I think your grandson will love him too.